If you are replacing your garage door, then you may already be aware of the styles available, however you might not. If you are still at the stage of considering whether a garage is for you, then you are less likely to have a good knowledge of the styles you can choose from for your garage door installation. Read on to find out more. Steel is the kind of garage door you are probably more familiar with. These garage doors are simple yet strong, and relatively cheap. Steel garage doors are also fairly low maintenance, meaning there is little cost incurred after the installation. Steel doors tend to be available in a range of different colours, so if you’re after colour with your garage door installation then these may be the type for you. Timber garage doors are great for creating a warm and welcoming feel, and can significantly enhance the aesthetics of your home. They do, however, take more looking after, making it necessary to weigh up importance of appearance versus willingness or ability to take care of the doors. GRP doors (Glass Reinforced Polyester) aren’t the cheapest of doors, but they do add extra strength and robustness to help prevent break-ins. Roller garage doors are also usually available in a range of different styles and colours. These types of doors are best if you are trying to save space, as they roll up into a small area and take up much less room when open. Sectional garage doors are space savers like roller doors, except that they are made up of individual sections that fold away easily as opposed to rolling. 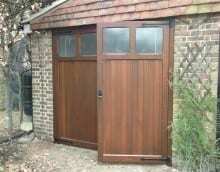 These doors are ideal if height is a consideration with you garage door installation. Side hung garage doors open much like normal doors, and can be a great choice if room inside the garage is restricted but room outside is ample. These kinds of doors are great if you are looking for a more individual look. No matter whether your doors are roller, sectional or side-hung, lots of companies carry out garage door installation of electric doors as well as the traditional manual type. Whilst they can be expensive, they can be ideal for anyone who is disabled or has trouble with the door. If you would like any help, information or would like to choose styles for your garage door installation, visit NDC Garage Doors today.